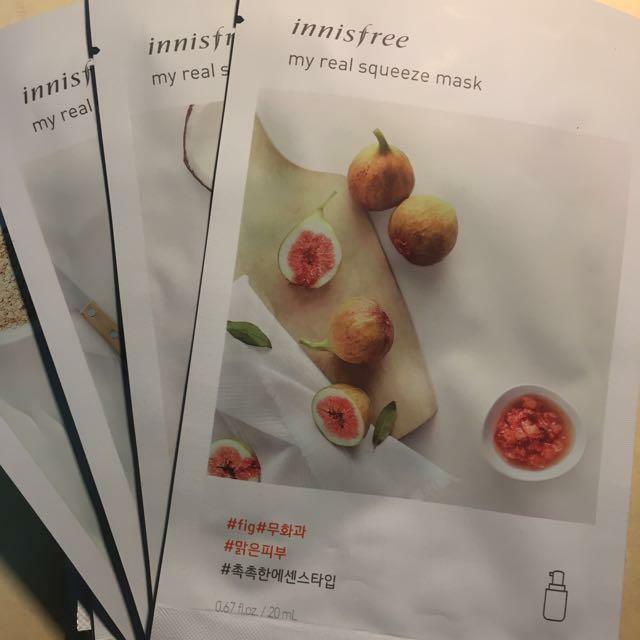 Radiant your Skin Care with the [Innisfree] My Real Squeeze Mask 5ea (Fig)! we aim to provide you best korean products to take good care of your skin, including Cosmetics, Masks, Mask Sheet. Hydra Mask Sheet online. Innisfree My Real Squeeze Mask Fig : rich in vitamins and antioxidants, providing youthful, toned moisture and conditioning. kim…@gmail.com I'm not sure why I thought this mask was going to leave my face stuck even before trying it, but it didn't! I had left it on for an hour because I fell asleep, but it was still pretty wet when I woke up to remove it. My face felt nice and moisturized afterwards! It has a nice smell to it and the mask itself fit my face very well. There was also a lot of essence left over in the packet afterwards. With the Innisfree sheet masks, there are water types, essence types, and cream types. This one was an essence type, so I was expecting it to be thicker than the water type masks but it was still light enough for me to be able to use everyday! I would buy these again!